Some people study ball player stats. Gardeners study plant stats. Unlike a ball player's physical stats plant stats can vary significantly depending on the growing conditions. In particular plant heights are listed as ranges; 3-6 feet for example. During this perennially wet season perennials have hit home run size with luxuriant leaves and bodacious blooms. Plants are taking advantage of ample water; that is as long as they aren't drowning in the deluge. One of the showiest of summer perennials enjoying our wet season is Beebalm (Monarda didyma). It's eye-catching, car-stopping flower colors vary from white, pink, red, blurple to a boisterous purple. The intense flower colors and almost complete flower cover brands them as true beauties of summer. Each flower inflorescence is a miniature firework with an explosion of nectar tubes. The regular show of hummingbird and bee visitors reveling in each flower's sweet treats adds to the summer theatre. Beebalm flowers create a mass of summer color, often lasting 4-6 weeks. If spent flowers are removed soon after flowering, the flowering time can be extended another 2 weeks or more. 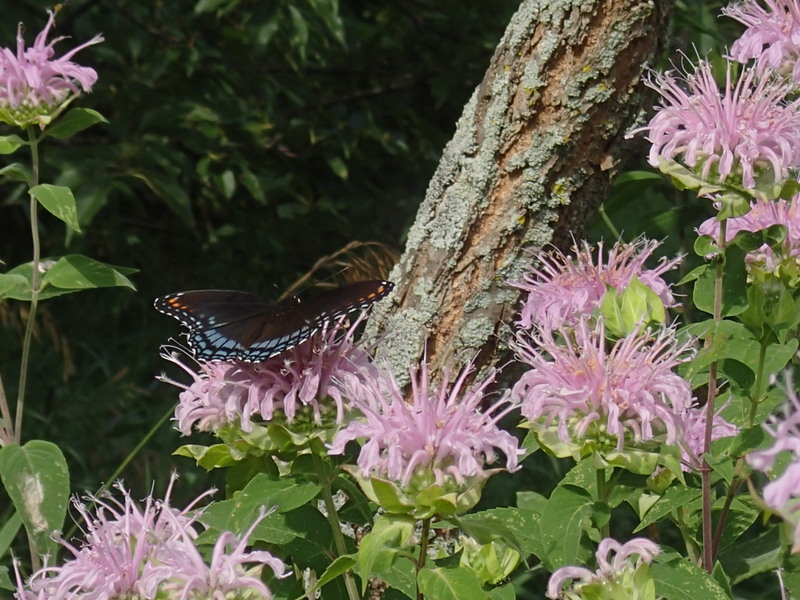 In its native range of eastern U.S. beebalm grows along streams and in woodlands. Hence it grows best when moisture levels are regular and plentiful in full sun to partial shade. Beebalm's local prairie relative wild bergamot (Monarda fistulosa) is much more tolerant of dry conditions, but isn't shy about growing taller when moisture is available. As a member of the mint family beebalm possesses the characteristic fragrant leaves and square stems of the family. Beebalm plants grow in ever expanding clumps. Without competition from other plants beebalms may show their mint heritage by spreading beyond their desired location. Just grab a spade and share plants with your friends or move parts to other areas of the garden. As with many plants that grow in expansive clumps beebalm may form "donut" growth, a dead center with actively growing stems on the outside edges. Donuts are enticing on a breakfast plate, but not in the garden. To keep beebalm looking its best divide plants every 2 to 3 years in April, avoid overhead watering and crowding and remove diseased stems after flowering. Particularly in dry years and in crowded garden plantings, beebalm can succumb to leaf diseases such as powdery mildew. Generally plants don't die from the disease; however, the leaves turn an unsightly brown and hang on the stems. Fortunately several cultivars available list powdery mildew resistance. 'Blue Wreath' – purple red flowers at 2-4 feet tall. 'Colrain Red' – deep purple red flowers at about 3 feet tall. 'Gardenview Scarlet' – large over 3-inch wide inflorescences of red flowers that nearly cover 4-foot tall plants. Quite a spectacular garden view. 'Jacob Cline' - deep red flowers, often reported as the best mildew resistant cultivar available. 'Marshall's Delight' – purple pink flowers on 3-4 foot tall plants. 'Petite Delight' - at only 1.5 feet tall rosy pink flowers and compact growth, great for containers and smaller gardens. 'Raspberry Wine' – deep purple red flowers cover 4-foot tall plants. 'Croftway Pink' with soft rosy pink flowers and 'Cambridge Scarlet' with red flowers are common cultivars but unfortunately show susceptibility to mildew. 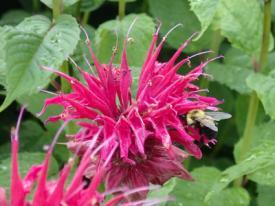 Many beebalm cultivars are hybrids between beebalm and our prairie wild bergamot (Monarda fistulosa). Wild bergamot is also great in the garden with its more sedate light pink flowers. 'Claire Grace' is a wild bergamot cultivar with lavender colored flowers and great powdery mildew resistance. Our weeds may also be growing bigger than ever this year. Just put on your blinders and enjoy the luxuriant look of summer perennials.